After spending the first two months kind of getting settled, I am realizing that I am just about at the half-way point of my stay already. While there are some pieces that I need to be attentive to for the phases that come next, I mostly want to slow my thinking down a bit and stay present here. With so many good things to come, that is not always easy. Things here are great. I got to use my jumper cables for the first time at work on Thursday. What could be more fun than that?! When I first started driving my dad showed me how to change a flat tire and to use jumper cables, I've just never gotten to do it until then. Two of the women at work have a car that is badly in need of repairs (and a new battery). I suppose Monday I'll find out if they made it to school or not. Yesterday I got to see a bit of town with one of the sisters here. We went saw where the bridge fell, some of the other beautiful bridges here, and also toured the Mill City Museum. 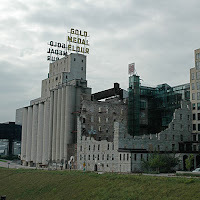 Minneapolis was big for flour mills years ago. It was actually a very interesting tour, a good place to bring a classroom of kiddos. Although unless I'm teaching in St. Paul (too cold!) I think it might be a little far. I'm reading a very good book for some spiritual reading to accompany prayer. I've probably mentioned it before: "We Walk the Path Together." It fits together pieces of Buddhist meditation with Christianity. Excellent. The last chapter was on water and waves. Using that image the author speaks of each of us as a wave and asks how long it takes for the waves to realize their source and the fact that their composition is that source. It was for me the "I AM" that God speaks to Moses. The "I AM" that each of us can claim. Good prayers. Anyway, the sun is out! I'm hoping after lunch that it will be sufficiently warm to get outside and do some yardwork. Either that or a bike ride. We'll have to see. Enjoy the warmer fall days while they're here. I don't blog very much.